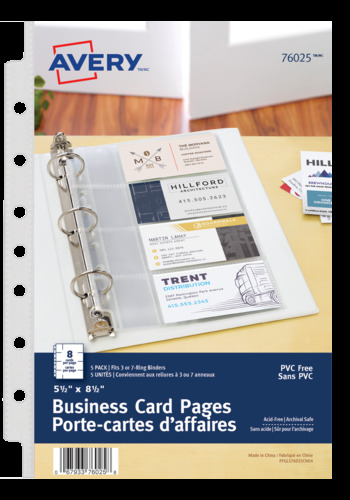 Keep your contacts and business network organized while on the go with Avery® Business Card Pages for 5-1/2" x 8-1/2" binders. Mini sheets are pre-punched for storage in either a three or seven ring 5-1/2" x 8-1/2" binder for easy reference and organization. Each business card page can hold up to 8 business cards, with 4 cards per side. Keep your contacts and business network organized while on the go with Avery® Mini Business Card Pages. Mini sheets are pre-punched for storage in either a three or seven ring 5-1/2" x 8-1/2" binder for easy reference and organization. Each business card page can hold up to 8 business cards, with 4 cards per side. The durable non-stick, PVC-free and archival safe holders will keep business cards in top condition. You'll be successful in organizing your network with these pages, even while on the move. 5-1/2" x 8-1/2" protectors are 7-hole punched for use with mini binders and organizers. Organize cards for easy access and quick reference. Pre-punched pages for convenient storage in binders makes it easier to find important contacts. Card holders are strong enough to protect cards from spills and tears and are clear to easily view all your cards.